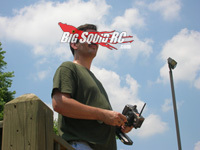 ASK Cubby, 02.27.2014, Version- Best Answers Ever (Without Actually Reading the Questions) « Big Squid RC – RC Car and Truck News, Reviews, Videos, and More! What do you think about the Tarmac TIRE D COMP which is being used on the HPI WR8 Flux? Does it have good grip on the asphalt? Their pattern doesn’t seem fit for such surface. Cubby- Yo, hey now Omar, thanks for email. We’ve gotten in a bunch of time with an HPI Ken Block WR8 Flux and I do have one comment about the stock tires- because of the monster power available, they don’t last long. LOL. As far as traction goes, they weren’t bad, but any time you mash the gas they became pizza cutters, and as you know, any tire twice its normal diameter isn’t going to get much traction. I would highly recommend belted tires as a replacement, but that’s just me. Live long and prosper my friend… oh and shoot Brian your snail mail for a sticker pack. I am thinking about getting a 1/8 scale Monster truck. I think I have narrowed it down to the Savage Flux HP, or the Thunder Tiger MT4 G3. I have seen the shootout you have done with the 2wd monster trucks but have not seen any thing similar with the 1/8 4WD. Was wondering if you guys were planning to do a shootout? Maybe it would help sway my decision on which rig to pick up. Im sure many others would enjoy reading up on the reviews/testing as well. Cubby- A 4wd, brushless, RTR, monster truck shootout is what I consider to be the “Holy Grail” of shootouts for BigSquidRC. It is my belief that for the majority of BSRC readers, that particular class of machinery is their preferred weapon for bash destruction. If we were bust out that shootout, I’m quite certain it would be a huge hit among our readers, and do a dern good job of melting down the servers. So… why haven’t we done the shootout? We’ve had all the trucks needed for the shootout, the MT4 G3, the Savage Flux, and the E-Revo. However, we’ve never had brand new units all at the same time in the same place. To do a legit shootout we can’t use beat up or modified trucks, they all need to be equal, right off the assembly line, and we just haven’t been able to pull that off yet. But… 2014 is looking to be the “Year of the Monster Truck”. There are a bunch of new units hitting the market, big, nasty, and overpowered, so the time is right to do our big MT shootout. Yes, it will happen, it has to happen. It’s who we are, it’s what our core readers want, it’s just a matter of time until we get our Ps and Qs together. Oh and yea.. I’m pretty sure you’d be happy with either of those trucks you have narrowed it down to, they are both great bashers! That’s it for this week ya lunatics, shoot me whatever is floating around in that deranged mind of yours to Cubby at BigSquidRC.com. Get a free sticker pack if your letter makes the front page, and win a t-shirt if I proclaim yours as “letter of the month”.